Please consider sending your manuscript now or up until the deadline as they will be published on an ongoing basis and we will arrange for a fast peer review process. Submitted papers should not be under consideration for publication elsewhere. 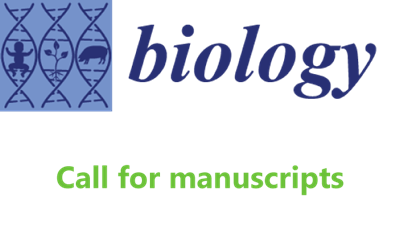 We also encourage authors to send a short abstract and tentative title to the Editorial Office in advance (biology@mdpi.com). An 650 CHF (Swiss Francs) publication fee applies for each accepted paper. For papers submitted after 30 June 2019 an APC of 1000 CHF applies. If your funds are limited, you may apply discount or waiver. The numbers of discount and waiver are limited. If you need this, please apply it as soon as possible. /Biology/ is an international, peer-reviewed, quick-refereeing open access journal of Biological Science. /Biology/ is indexed by PubMed (NLM), Zoological Record (Thomson Reuters), Scopus (Elsevier), etc (http://www.mdpi.com/journal/biology/indexing).